But let’s compare plans with reality. The facts on when people are actually retiring are revealing. According to the Employee Benefit Research Institute, the median age at which people are retiring is lower: 62.³ The median has remained the same since 1991. In fact, 50 percent of retirees left the workforce even earlier than they’d planned! Respondents who retired at 62 generally reported that they retired three years earlier than they had expected. And while only 8 percent of pre-retirees surveyed said that they plan to retire before they turned 60, 36 percent of those who actually had retired said that they had, in fact, retired at least 3 years earlier than planned. (The saying ‘Man plans and God laughs’ comes to mind. Perhaps we should add ‘and your employer is doubled over in hysterics’). So, it’s prudent to plan for retirement – and also for a scenario where the transition happens sooner than expected. Following the financial crisis, the company I worked at for 26 years was acquired by a larger competitor. In 2009, I found myself contemplating a transition earlier than expected. There were things I did well in preparing for this, so I have some lessons to pass along. Do I want to continue what I’ve been doing in the same field? Or is it time to think about doing something different? How about something totally different? If you decide to stay in the same field, don’t waste this opportunity to think about what you would like to do later on in an encore career, after retirement. Join a relevant organization so you can learn more about a potential new field. Volunteer to help in some way. Often, volunteering to help a subcommittee of the organization is a great way to get involved and learn more. Identify a class you can take, either a traditional one or a virtual one. Consult with people who have navigated a transition, either to retirement earlier than expected or to a different line of work or a different pace of life. Pick their brain on how they did it. Find out what the biggest challenges were and what they did to meet them. Ask what they’d do differently knowing what they know now. No matter what scenario you choose, this is an excellent opportunity to take stock of your network and relationships. Identify people who you want to touch base with or reconnect with. While this often falls to the wayside with busy people, it’s a smart move to tend to your network so it’s there when you need it. Who should I reach out to and reconnect with? Who should I get to know? 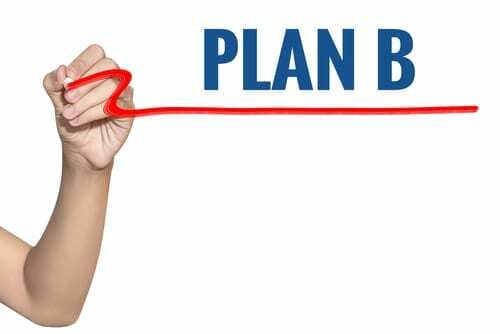 Start the conversation with your spouse or significant other about your Plan B scenario. What are his or her thoughts? If one of you, or both, needed to transition earlier than expected, what are your priorities? Would you be open to the idea of moving? Thinking ahead and taking prudent actions now can prepare you well for a scenario where the timing decision may not be yours alone. As an added benefit, it may just lead you to doing what you really want to do sooner than you plan to. Report on the Economic Well-Being of U.S. Households in 2013. Board of Governors of the Federal Reserve System (July 2014). The 2015 Retirement Confidence Survey. The Employee Benefit Research Institute, March 2015. The 2016 Retirement Confidence Survey. The Employee Benefit Research Institute. March 2016. The Transamerica Center for Retirement Studies. The Current State of Retirement: Pre-Retiree Expectations and Retiree Realities. December 2015.